GreatFire: "Technology has been used to censor online speech -- and to circumvent this censorship"
Wikipedia founder Jimmy Wales read anonymous collective GreatFire’s acceptance speech. 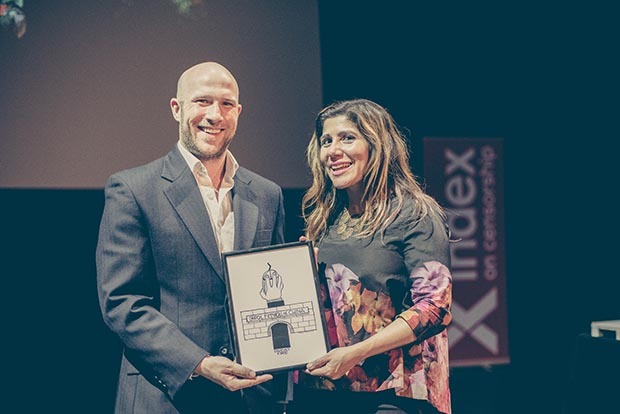 We are honoured to have been chosen as the winner of Index’s 2016 digital activism award. We’d like to take this opportunity to highlight the incredible and important work being done by the other digital activism nominees who are as, if not more, deserving of this award. We would not be in this position if it were not for the support of others. Thank you to those who have provided us with the means to dedicate ourselves to GreatFire. Thank you also to the many individuals within China who have made personal donations. Sadly, many news organisations have their content blocked and censored in China, but we thank those organisations that have chosen to work with us to deliver uncensored information across the great firewall. A big thank you to our developers, past and present, who have contributed to all of our projects. Without you, none of this would be possible. And finally, thanks to all Chinese who have supported our efforts from the start. Millions of people have visited our websites, shared our content and downloaded our apps. This incredible support not only gives us the energy to continue our work, it also highlights the great demand that exists in China for unmitigated access to an uncensored internet. Since the early days of the internet, technology has been used to censor online speech — and to circumvent this censorship. The Communist Party of China built the Great Firewall, which one-by-one has closed down access to YouTube, Twitter, Facebook, Google, most Chinese-language news sources hosted outside China and, most recently, Wikipedia. In response, VPN services, proxies and other circumvention tools were developed. On domestic social media websites like Sina Weibo (pronounced “way-bow”), sophisticated keyword and message filtering has been developed by the censors. In response, clever users made use of homophones and images to bypass the filters. Because there is always a workaround, it may seem as if online censorship is failing. Such an optimistic conclusion, however, would be based on a misunderstanding of the intent of the censors. Their goal is not to completely deny access to certain topics, but rather to prevent these topics from reaching the mainstream. Unfortunately, in this mission they have been successful. VPNs are only an option for people with knowledge and the means to pay. Free circumvention tools are usually difficult to find, complicated to use or unstable. Homophones on domestic social media are only understood by those who already know the story background. We believe that to make a real impact we have to reach beyond these users and offer a compelling, uncensored, mainstream service. With these goals in mind, we created FreeBrowser, a free Android browser app with built-in circumvention. On the default start page of the app, we promote uncensored news from a wide range of sources. To reach more users, we all need your support. Feel free to visit our websites, including freebrowser.org, or reach out to us directly via email or social media. We believe that our impact as well as the impact of all projects combating censorship should be measured by the degree to which we bring censored topics back into the mainstream. Freedom of speech was declared a human right 67 years ago. To make it a reality requires us to raise our ambitions, to collaborate and to demand change. Thank you!